First there were desktop PCs. Then came laptops, and both coexisted for some time. Then a little thing called the iPad arrived to disrupt the market, and laptops have never been the same again. Today we have all sort of different products available, like convertibles and hybrid machines. But what is exactly a “hybrid machine”? Is it a laptop that bends all the way to be some kind of oversized tablet? Not necessarily. As Microsoft’s Surface line has proven, it can be the other way around, and today we’ll be looking at that. 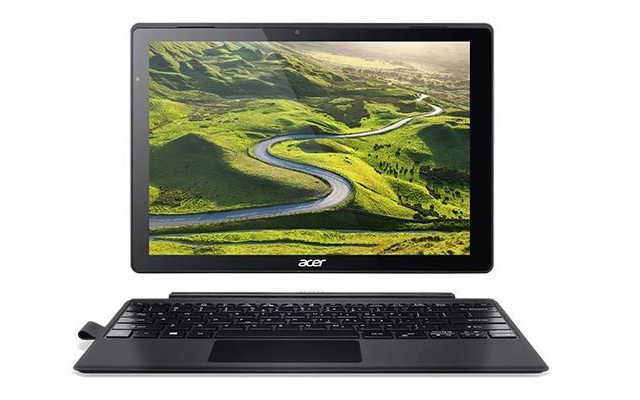 This is the review of the Acer Switch Alpha 12 SA5-271-78M8. Pros: great QHD IPS display, competitive price, powerful Intel Core i7 processor, 256GB SSD storage, 8 hour battery life. When we say “other way around”, we’re actually talking about a tablet that can work as a laptop too. That’s exactly what the Acer Switch Alpha 12 SA5-271-78M8 is: a 12 inch tablet that comes with a dedicated keyboard that you can attach to it. It has an all-back presentation weighing in just 2.8 lb, a light machine to be sure. The screen is one of the most powerful specs here, since we’re talking about a QHD panel. That’s a 2160x1440 resolution, no quite 4K but well above Full HD 1080p options. It’ also an IPS panel, a must for portable gadgets like this one, which is essentially a tablet. A moderately big one at that, one that will probably excel thanks to Windows 10’s touch friendly capabilities. We could tell in this review of the Acer Switch Alpha 12 SA5-271-78M8 that this packs a punch. That’s because it comes with an Intel Core i7-6500 processor, one of the highest of the company’s low voltage line. This is a dual core chip clocked at 2.5 GHz and, being on high-range category, will let you do everything from web browsing, multimedia consumption and even demanding tasks. The multitasking corner follows a similar pattern. The Switch Alpha 12 SA5-271-78M8 offers 8 GB of LPDDR3 RAM, the modern standard for capable machines such a this one. This means you’ll be able to run several browser tabs and applications simultaneously without having to worry too much about annoying loading times. Being the kind of machine that it is, it’s expected that the Acer Switch Alpha 12 SA5-271-78M8 doesn’t have a dedicated graphics card, and that’s the case here. Instead, we’re left with the Intel HD Graphics 520, an integrated unit that fortunately shows how better integrated graphics have become over the year. That’s so even to the point of being able to handle modern hits in low settings. On the other hand, less demanding titles like The Sims 4, for example, or indies like Undertale will run smoothly without a doubt. The Switch Alpha 12 SA5-271-78M8 includes a 2-cell lithium ion battery with a 4870 mAh capacity. Acer claims that this will get you up to 8 hours of battery life, and even if you expect a bit less, we can’t help but feel this is an above-average number. And of course, this being basically a tablet, this is what we want from it. At first glance, connectivity might be an issue, but that’s actually not the case. The Acer Switch Alpha 12 SA5-271-78M8 comes with a conventional USB 3.0 port, but the secret weapon is the USB Type-C that’s capable of all things USB-related, but also new things like connecting external displays and powering the laptop. Fortunately, Acer includes its own charging port. Oh, and it also comes with a microSD slot. The storage is even better thanks to the 256 GB solid state drive, which we believe is the perfect balance between raw storage space and the unbeatable performance of SSDs. In laptop terms, this is a nice option. Tablet-wise, though, this is overkill in the best possible way. After reading through the review of the Acer Switch Alpha 12 SA5-271-78M8, we can come to the conclusion that this is an excellent, cheaper option to the now established Surface line from Microsoft. Still, though definitely less expensive, it doesn’t hold back thanks to its high resolution screen and powerful processor.